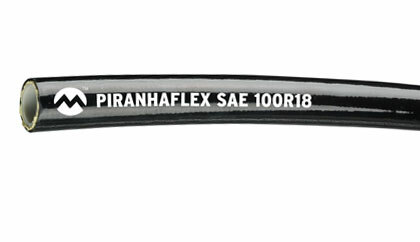 Piranhaflex™ 100R18, PF427 Series Hydraulic Hose: Ideal for general purpose high pressure hydraulic applications with a constant working pressure of 3,000 psi for each available ID size 1/4", 3/8" and 1/2". This hose is commonly used in industrial hydraulic construction, material handling and agricultural equipment. Piranhaflex™ 100R18, PF427NC Series Hydraulic Hose: Has an orange, non-pin pricked cover, ideal for use in applications where a non-conductive, high pressure hydraulic hose is required. Typical applications include: hydraulic tools, lubrication lines and man lifts. Click here for more info.